Justin Townes Earle’s name alone stirs a certain amount of expectation and curiosity before one hears a single note of his debut solo release, “The Good Life”. How could it not? Justin is the son of acclaimed troubadour Steve Earle and is named for his father’s hero, the troubled country/folk genius, Townes Van Zandt. But within the first twenty seconds, Justin Townes Earle establishes that he’s not going to be dwelling in the shadow of either of his namesakes. In fact the fiddle and pedal steel guitar make him sound more like a descendant of Hank Williams than Steve Earle. This is a country album. It’s honky tonk music. It’s music for sipping iced tea on a country front porch. It’s dance-with-your-best girl/guy music on a Saturday night. Two of the song titles mention the word “lonesome” (make that three if you want to count “lone” as in “Lone Pine Hill). One mentions “leaving” and one’s called “Hard Livin’”. There’s even train imagery just for good measure. It’s country music the way country music was meant to be played. That’s not to say the 25 year old Earle doesn’t have a few surprises up his sleeve. Tracks one and two fool you into thinking that this album will be straight ahead country through and through, but then with tracks three and four, he proves that he’s got serious songwriting chops and the ability to stray from the style he establishes up front. “Who Am I To Say” has Earle alone on acoustic guitar singing a bare-bones statement that he’s not about to judge how one gets through their days and nights. He follows it up with a haunting ballad about the lonesome tale of a Civil War veteran. This song, “Lone Pine Hill”, is the one instance where I can hear the Townes Van Zandt influence, which is definitely not a criticism. It’s a brilliant song that I can hear a still-strong-voiced Van Zandt capturing an audience with if he had written it first. This is a country album. It’s honky tonk music. It’s music for sipping iced tea on a country front porch. It’s dance-with-your-best girl/guy music on a Saturday night. Two of the song titles mention the word “lonesome” (make that three if you want to count “lone” as in “Lone Pine Hill”). One mentions “leaving” and one’s called “Hard Livin’”. There’s even train imagery just for good measure. It’s country music the way country music was meant to be played. The remainder of the album is filled with plenty more brilliance as well, whether it be in the form of old-timey sounding country (“What Do You Do When You’re Lonesome”, “Ain’t Glad I’m Leaving”) or in the quieter, more introspective songs (“Turn Out My Lights”). And what of the Steve Earle influence you may ask? I can hear a bit of his father’s slightly gravelly voice and maybe a little of his songwriting style in the last track of the album, “Far Away in Another Town”. But for the most part, this album is about Justin and his unique gifts and less about the names he carries. For the most part, I was so hypnotized by his lyrics, emotive voice, and amazing band that I forgot about the famous name part. I’m sure that’s what Justin Townes Earle hopes for. The influence is there if you look for it, but this is not an album of imitations. 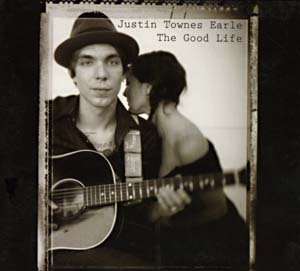 This is an album that establishes Justin Townes Earle as the genuine article. If any imitation is to happen, I hope that Nashville starts producing more music like the brand of country that Earle is producing. Josh Turner "Jackson County Fair Performance"